James Watson’s 1968 book The Double Helix was highly controversial. Its unintended consequence was to revive the largely forgotten name of Rosalind Franklin. We’ll never know Franklin’s views on her unflattering portrayal in The Double Helix – she died aged 37, 10 years before the book was published. Francis Crick and Maurice Wilkins, who shared the 1962 Nobel Prize in Medicine with Watson, were incensed by early drafts of the book they saw. Watson wrote the book from his perspective as a young man – the book covers the time he was aged 23-25 years old – chasing one of the the twentieth century’s greatest discoveries. The book was gossipy; it was indiscreet; it was not deferential to older, eminent scientists; and it related inside information about Watson’s colleagues. No scientist had ever written anything like it before. Crick got an early draft of the book and began corresponding with Watson about it in the spring of 1966. He sent Watson a long list of factual errors he’d found. 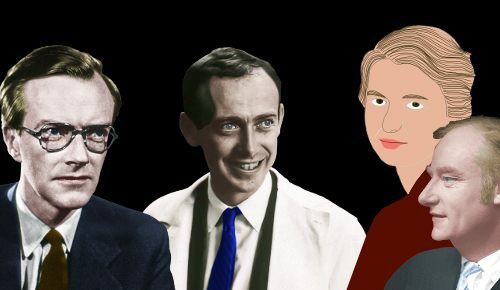 Maurice Wilkins, whose professional relationship with Rosalind Franklin had been disastrous, told Watson that he would not stand aside while she was discredited. Finally, Crick threatened Watson with legal action for defamation if the book were published. He saw it as a huge invasion of privacy; he had always avoided personal publicity – he wouldn’t even allow his photo to be used in books. The following month, Crick wrote Watson again. This time he said that if Watson invaded his privacy, he would reciprocate. To show what such an invasion would mean, Crick threatened to write a book entitled The Loose Screw. The first chapter would detail Watson’s personal deficiencies as seen by Crick, such as his speech impediment, juvenile handwriting, etc. He would send each chapter to Watson as he completed it. If Watson published his book, Crick would publish The Loose Screw. It’s likely Crick never intended writing these chapters – he was just trying to get over to his former colleague how personally hurt he felt by Watson’s book. Crick and Wilkins sent letters of complaint to Harvard University Press, the book’s prospective publishers, claiming it would be unethical to publish a book that Watson’s closest collaborators objected to. Watson made some edits in an attempt to mollify Crick and Wilkins, but would not back down: he was going to publish regardless of their objections. In April 1967, Crick told Watson that the book was misleading, in bad taste, and a violation of friendship. History, he said, would condemn Watson for it. In May 1967, Harvard University Press withdrew their offer to publish Watson’s book, saying to do so would go against their disputes policy regarding eminent scientists. Watson, however, found another publisher – Atheneum. Crick could not get the book stopped; and he also failed to persuade his boss, Sir Lawrence Bragg, not to write The Double Helix‘s preface. The Double Helix was published in January 1968. Erwin Chargaff, whose discovery of 1:1 ratios in DNA base pairs was one of the crucial clues leading to Watson and Crick’s discovery, reviewed The Double Helix for Science in March 1968. It is a great pity that the double helix was not discovered ten years earlier: some of the episodes could have been brought to the screen splendidly by the Marx Brothers. The Double Helix has sold over a million copies. 50 years after Watson wrote it, it remains controversial. A full and fair account of Rosalind Franklin’s life can be found in Brenda Maddox’s The Dark Lady of DNA. Some of Crick’s correspondence is available at the Wellcome Library.